A few weeks ago our church family began praying for a dear member, Mrs. Diana Graham. Diana came to our church with her family in 1997. Their then teenage son, Clark Graham, later graduated from our high school and college and now serves as a missionary with Brother Rick Martin in the Philippines. Brother Graham and his wife Rachel have been a blessing as some of the first young missionaries sent from our church. Mrs. Graham was diagnosed with cancer and after chemotherapy treatments, had a few good days of conversation with her husband and family at home. In the Lord’s timing, however, He called Diana home last Friday. The funeral service for Mrs. Diana Graham will be this Wednesday at 11:00 am. Her husband, Curtis, has also been a faithful member of our church and their daughter Elizabeth is a member of our staff. 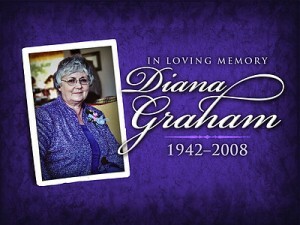 Diana Graham was a servant in so many ways. After her son, Clark, had made a missionary trip to the Philippines, Diana began to take an interest in the work there. Clark is an expert viola player and had helped start an orchestra at the IloIlo Baptist Church. Mrs. Graham took it upon herself to purchase and send dozens of instruments to the Philippines for this tremendous orchestra. In addition, she volunteered several days a week, helping sort choir music before and after each service. Her service to the Lord was often behind the scenes but never unnoticed by God. Times like these are difficult in many ways. It is difficult to understand God’s timing, and it is difficult to say “goodbye” to someone who has been a faithful friend and co-laborer. From a heavenly perspective, we know that there is joy in Heaven and we are thankful that Diana is no longer in pain and is now with her Saviour. I also am confident that she does not regret living a life of service for the Lord. Her legacy lives on as we see her children and grandchildren serving the Lord here in Lancaster and on the other side of the world in the Philippines. May we each be challenged today to live for Christ in this needy hour!